Students in the Monroe 2-Orleans BOCES New Visions program learned about the opioid epidemic from those who see its effect every day. The class hosted law enforcement officials and a local counselor as part of their health career exploration program at Monroe Community Hospital. 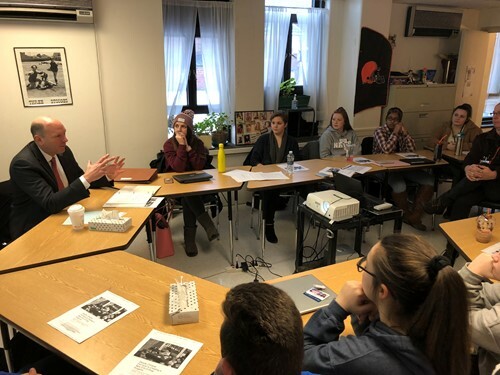 Assistant U.S. Attorney Doug Gregory and Investigator Ed Bernabei spoke to the class about the epidemic’s impact on people they see through the legal system. Gregory prosecutes drug cases in federal court and Bernabei performs criminal investigations for the Monroe County District Attorney’s office. They talked about lives ruined and the risk of violence associated with criminal drug trade. In a subsequent session, Counselor Keith Greer visited the class. He spoke of the challenges those suffering from substance use disorder face in breaking their addiction and leading a healthy lifestyle. Students learned it can be a lifelong battle that often started with recreational drug use that quickly grew out of control. New Visions Health Teacher Todd Pschierer arranged the guest speaker visits. Students in his class are part of the Health Professions Career Cluster exploring possible careers in health care or medical professions. Monroe 2-Orleans BOCES New Visions is a one-year career exploration program that provides highly motivated seniors with the opportunity to gain valuable insights into career options from a real-world perspective. Area businesses, colleges, health care and government facilities provide the setting for immersed learning in a career field of interest to the student. Feature photo: Assistant U.S. Attorney Doug Gregory speaks to New Visions students at Monroe Community Hospital.